President John F. Kennedy announced in 1962 that NASA would send astronauts to the moon by the end of the decade. The Space Race created a technological boom, inspiring an entire generation to pursue careers in science, technology and engineering. Over time, as the balance of world power shifted, the public's interest in space exploration declined. 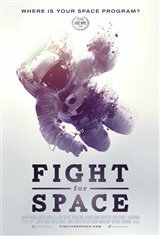 This documentary examines the past, present and future of the U.S. Space Program through in-depth interviews with leading experts on space travel, including astronauts Jim Lovell and Story Musgrave, astrophysicist Neil DeGrasse Tyson, engineers, space industry entrepreneurs and more. Restored film footage and years of historical research takes us back to the beginning of NASA and to the future, including taking a look at The Space Launch System, scheduled to carry humans into space in 2018.